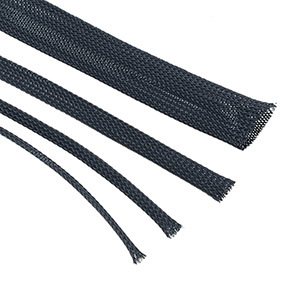 Flexible braided sleeving for protecting wire harnesses. The sleeving offers excellent resistance to abrasion, inflammable liquids, alkali solutions and UV light. The sleeving is woven which allows wire to pass through the sleeving wall, whilst maintaining very durable characteristics.